The FS41 is an integrated Hall effect latched sensor designed for electronic commutation of brush-less DC motor applications. 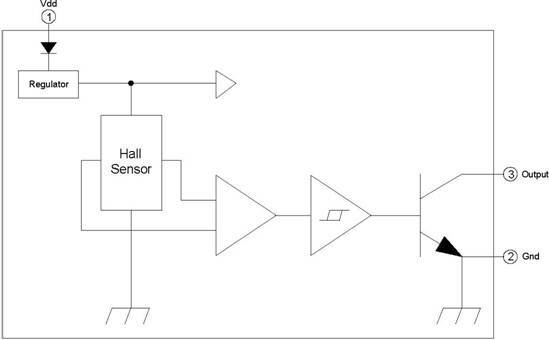 The device includes an on-chip Hall voltage generator for magnetic sensing, a comparator that amplifies the Hall voltage, and a Schmitt trigger to provide switching hysteresis for noise rejection, and open-collector output. An internal bandgap regulator is used to provide temperature compensated supply voltage for internal circuits and allows a wide operating supply range. A north pole of sufficient strength will turn the output ON. In the absence of a magnetic field, the output is OFF.